Keep yourself and your home cool this summer, even in the hottest temperatures with these tips. Making small changes to ceiling fans and windows can have an impact! Summer is here. Time to put away jackets, sweaters and thick socks and pull out t-shirts, shorts and flip-flops. With the mercury rising, it’s also time to start thinking about comfort, safety and readying your home for the long, hot days on the horizon. Try these tips on what to do in extreme heat to stay cool, even when the season is at its peak. On a more DIY basis, keep your A/C unit going strong by installing clean filters and replacing them every month. Outside, clear away any obstructions (debris, plants, shrubs etc.) that could interfere with the operation of your A/C’s compressor. 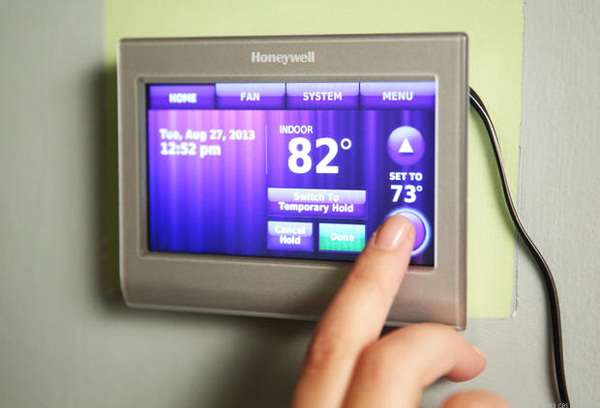 A programmable thermostat allows you to make small adjustments to your A/C unit’s on-off cycles. You can tell your A/C to run less frequently (or at a warmer temperature) while the house is unoccupied or scale back during the cooler evening hours, all without constantly fiddling with the thermostat. As a bonus, using even the most basic programmable model can help you save on your energy bills. Make sure the fan’s blades turn counterclockwise. This creates a breeze and circulates cool air. Insufficient insulation leaves your home vulnerable to extreme temperatures. Insulating materials work by retarding heat flow (conductive and convective) throughout your home. Warmer air will always seek out cooler air in order to achieve a balance in temperature. Depending upon insulation type and regional conditions, your attic insulation should be about 10 to 15 inches deep. Cleaning your refrigerator’s condensing coils can help ensure that on those blistering hot days, you’ll still have plenty of cool refreshments on hand. Check your owner’s manual to locate the unit’s coils. Turn off and unplug your refrigerator, then vacuum the coils to remove dust. An insect infestation can make even the mildest temperatures intolerable. If roaches, ants, etc. are constant visitors, it may mean that your home isn’t fully protected against the elements. Check your windows and doors and seal any gaps with caulking or new weather stripping. Repair or replace any damaged window screens. Inspect your foundation for any cracks or damaged vents, but keep those vents open. Remember, hot air rises and cool air falls. Your foundation vents promote air flow underneath your home, which helps prevent mildew and mold — both of which love the warm, humid summer months — from gaining a foothold. If your home is particularly exposed to full sun during the summer, consider replacing your existing windows with more energy-efficient models. Double pane windows can actually trap heat (in an air space separating the window’s interior and exterior glass) before it flows into your home. Replacement windows, which have a low-E (low emissivity) rating, are even more heat-resistant. The glass of these windows is glazed (coated) with a transparent UV-blocking compound that can cut solar heat gain virtually in half. The outside of your house takes a beating, and both sunny days and stormy nights take a toll. Pretty soon your house can look dirty and grimy. Buildup and debris — such as leaf litter in your rain gutters — also trap heat and moisture, raising the ambient temperature around your home. The best remedy is a thorough pressure washing. If you are unsure about how much pressure your outdoor surfaces (brick, vinyl, wood etc.) can withstand, hire a professional cleaner. Just be sure to pay particular attention to the deck, patio and other areas where you’ll be spending time relaxing in the shade.